Regularly we ask our users feedback about Route, in order to collect insights. In fact, we’re always open to talk about features we are missing or bugs that need to be fixed, so, don’t be shy! The news from last month are all about features asked by our users, that we’re happy to release now for everyone. Want to have more ideas about how to use Route and Zapier together? Go to our Zapbook right now and see another examples of Route integrations with your favorite tools in a Zap! Sometimes we want to create a new automation that is very similar to an existing one. 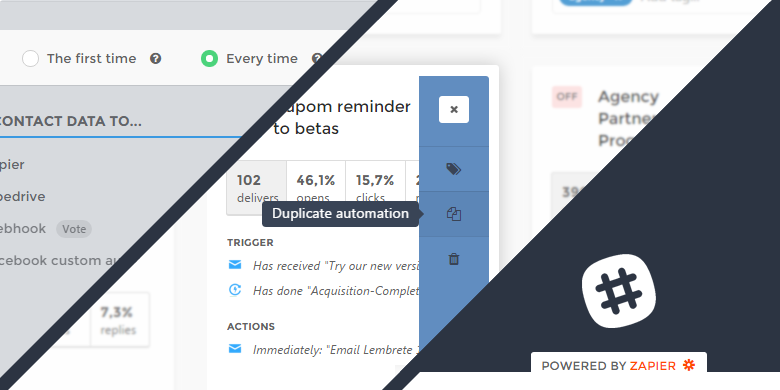 Instead of duplicating one manually, action by action, now you can do it with one click only! This is very useful, for example, when you have two similar flows like messages to customers who registered for a VIP service instead of your regular one. You could create the first one (regular service) and after that copy the automation and do the modifications to target your VIP users. We wanted to add this “Duplicate automations” to Route for a long time. Now, after receiving a lot of requests (specially from our Digital Agencies partners) to make it happen it’s finally done! By default, contact’s won’t receive the same email within an automation twice. But there are some cases where you want the same email to be sent every time a contact meets it’s conditions. Here enters the Transactional Emails! Imagine an email like a password reminder, for example, that you need to send every time your user hits “forgot your password?” and triggers an automation. Or a ‘Thanks to purchase’ email that you want to send every time a customer purchase something. Before adding the Transaction Emails to Route we wouldn’t send the same email twice after someone entered an automated campaign. Now you can choose to trigger the actions every time someone meets the conditions you’ve set. This feature is useful with you have campaigns to send transactional emails. And the best part of it: to set up you just need to select in a radio button in your automation the option you want! Obviously we did a lot more work last month, but none are more exciting than these ones (if you’d like to read about every changes we perform, man, you would go nuts!). P.S. : If you asked for a feature and we didn’t release it yet, don’t worry. Stay tuned and we’re sure we won’t disappoint you!